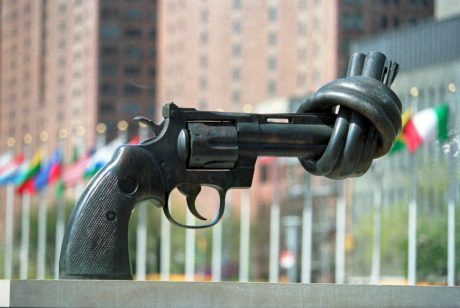 The annual UN observance of Disarmament Week, which begins on the anniversary of the founding of the United Nations, aims to highlight the danger of the arms race, propagate the need for its cessation and increase public understanding of the urgent tasks of disarmament. In its Resolution 67/39 the General Assemble “decides to convene a high-level meeting of the General Assembly on nuclear disarmament, that will be held as a one day plenary meeting on 26 September 2013, to contribute to achieving the goal of nuclear disarmament”. Arms Trade Treaty: This year during the annual United Nations Treaty Event – , much of the attention was focused on the Arms Trade Treaty, which was signed by 27 countries – including the United States – and ratified by three, bringing the total number of signatures to 113 and the total number of parties to seven.